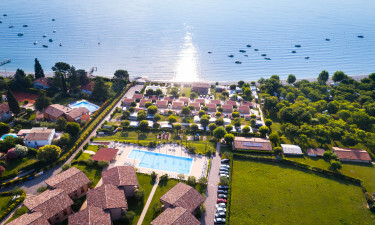 Located in the Bay of Manerba on the Western shore of Lake Garda, Onda Blu Resort is a green and pleasant oasis of calm where you can enjoy luxury camping. The more adventurous can also take advantage of discounted tickets to the fun parks near Lake Garda. 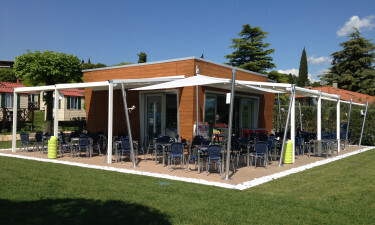 Perfectly situated to enjoy the natural beauty of Lake Garda, you will be tempted never to leave this luxury camping site. If you can tear yourself away though, this is the ideal base for further explorations and excursion. Why choose Onda Blu Resort? The spacious double pool means that there is plenty of room for all and the varying depths make it safe for all ages and standards of swimming. The stunning green surroundings make it a beautiful place to relax on a sunbed in the large solarium. Onda Blu Resort is located in the Bay of Manerba which has incredibly beautiful beaches including the famous Romantica beach which is the largest beach in the area.